In the rear bumper there is a ball coupling for the towing bracket which can be swivelled out when needed. The ball coupling cannot be removed. Bring the vehicle to a standstill and apply the electronic parking brake . Ensure that nobody is located in the path of the moving ball coupling , and pull the handle ① until the ball coupling begins to move. Once the ball coupling has been rotated into position, allow the handle to return slowly to its initial position. When the ball coupling has been swivelled into position but has not clicked into place, the indicator lamp ③ next to the handle flashes red. Keep swivelling the ball coupling until you hear and feel it click into place and the indicator lamp ③ next to the handle lights up green. If a dust cap has been fitted to the ball coupling, remove it and stow it in a safe place before attaching a trailer. The trailer socket is located on the left of the mechanically positioned ball coupling. 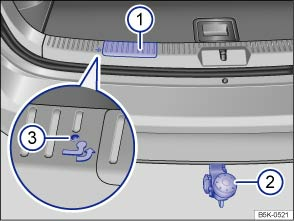 The indicator lamp ③ will light up only when the tailgate is open. Put the dust cap (if there is one) on the ball coupling. If used, remove the adapter from the trailer socket. Allow the handle to return slowly to its initial position. Swivel the ball coupling into the bumper until you hear and feel it click into place and the indicator lamp ③ next to the handle lights up green. Make sure that no people, animals or items are in the path of the ball coupling. Never interrupt the ball coupling, for example with tools, when it is swivelling. Do not use the towing bracket if the indicator lamp is not lit up green. If the ball coupling will not engage properly, do not use the towing bracket. Have it checked by a qualified workshop. Never operate the handle if there is a load on the ball coupling. If the smallest diameter on the ball coupling is smaller than 49 mm, do not use the towing bracket. Do not aim a high-pressure cleaner or steam cleaner directly at the mechanically positioned ball coupling or the fitted trailer socket. This can damage seals or wash off the grease required for lubrication.